I have a fabulous co-worker who used to live in Belgium and when she came to town once brought waffles coated in Belgian chocolate as gifts. They were sugary, crunchy and the chocolate was unbeatable (this coming from non-chocoholic). I’ve been in search of something similar locally ever since. 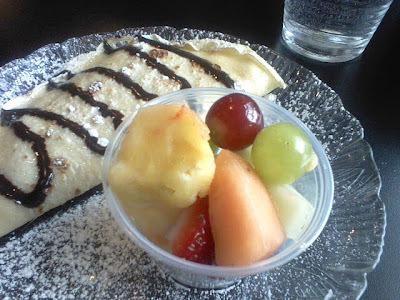 I’ve been a fan of this place called Taste of Belgium at the North Market in Columbus, OH where they make both delicious crepes and waffles, but I wanted something here in Michigan. The Wafel Shop is another in a series of new restaurants to open in downtown Ann Arbor in the last several months. Josh and I stopped in to The Wafel Shop for a light breakfast this past weekend, the first weekend they were open. Their standard waffles come with butter and powdered sugar, additional toppings are extra. I went with the Liege style waffle because it sounded very similar to what I had been looking for, sugary and crisp with the same dense texture. I added Biscoff spread and fresh raspberries. Josh chose the Brussles Wafel and added peanut butter and banana. To drink I had a caramel latte and Josh had a hot chocolate. The food and drinks came up quickly, everything seemed well organized and they had the right amount of staff while we were there for the early morning rush. 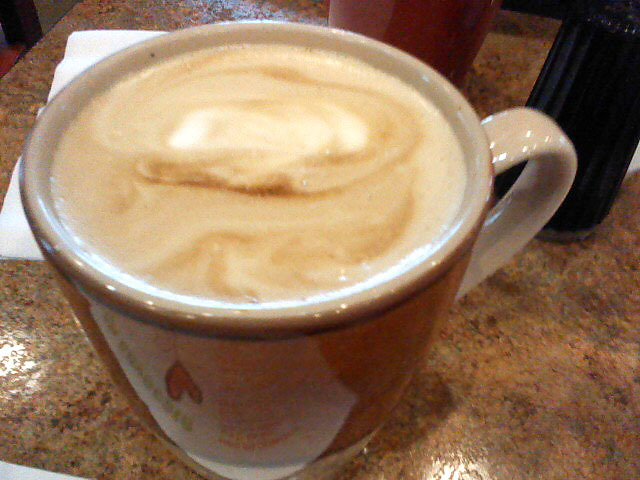 My latte was decent, not as good as some coffee shops in the area, but definitely serviceable. Josh really enjoyed the hot chocolate, and he’s pickier about that type of drink than most. I loved my waffle. It was thick, crispy on the edges and I could taste the sugar pearls that were inside that give it a real distinction from the typical American waffle. The Biscoff spread was sweet and had that sugar cookie goodness. I was glad I added raspberries because their acidity and tartness were perfect for cutting through the sweetness of the spread so it wasn’t too much. Next time I would leave the butter off, it didn’t add much with the other toppings already adding a richness. I tried a bite of Josh’s waffle and it was tasty too, although not as much flavor in the waffle itself it did have a nice light airy texture. It was good Elvis style with the banana and PB combo. I would definitely go back, but I think I’d prefer it for a snack or dessert to breakfast. I like more food in the morning and while I commend them for not trying to overreach and do too much, their menu is simple – waffles and drinks. The toppings aren’t enough to fill me up. I think they should continue to keep it simple though. They certainly seem to have mastered these Belgian style waffles and I don’t want to see that change. Dessert is just fine with me! They also had chocolate covered waffles in a case, why I didn’t get one on the way out is beyond me, especially because it may have been very close to the original Belgian treat my co-worker gave me! Next time for sure. There’s a great little coffee shop/cafe on Plymouth Rd. 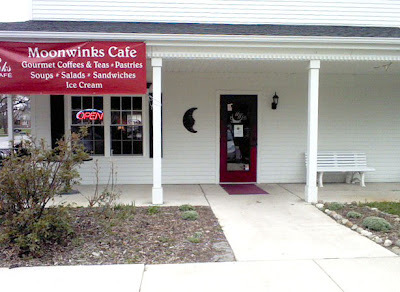 in Ann Arbor (technically the town of Dixboro) called MoonWinks Cafe. 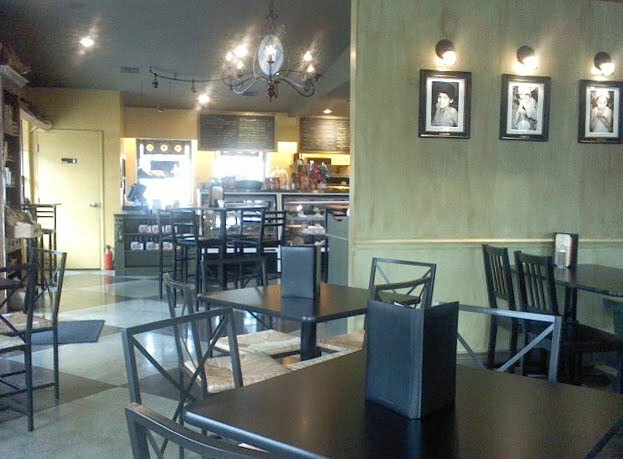 The decor is quaint and homey and the counter staff is friendly. Driving into the area of Dixboro, where the shop is located, is relaxing. It has a small town feel, even though you’re still in the Ann Arbor area. There’s a “general store” across the street that sells furniture and home goods. The cafe serves Zingerman’s coffee and espresso drinks at a fraction of the cost of getting from the original source, which I love (and it’s much closer, too!). I always get my vice, a caramel latte, and they serve the best foam of any local coffee shop I’ve tried. In my opinion, the foam is the best part of the latte (if it’s done right), but many places leave it off altogether. The foam at MoonWinks is a rich and thick treat in addition to the coffee underneath. I also love that they serve it in a mug for those of us dining in, not a common practice anymore. I’ve also stopped in for breakfast a few times and always loved their oatmeal with dried cherries because it tasted like slow-cooked oats. Unfortunately, they’ve taken that off the menu. I really hope they bring it back. My husband and I shared a fresh cinnamon roll last time and it was yummy. Unfortunately, it was so good we ate it before I had a chance to snap a photo! My husband always orders their breakfast burrito. Although he prefers the one at Beezy’s in Ypsilanti, he said this one is good, too.